Hartley and his sister are cervidae, human in form with deer-like features. They’re coming home from a late movie and only have a few moments before midnight strikes. When the Hunt starts. Hartley knows he’s tempting fate and urges Giselle to run. Almost silent in the darkness, a pair of felidae — half-human, half-lion — stalk their prey. The lioness, Leanna, chases after Hartley, closing in for the kill, while her cousin Tau races behind her, eager to catch the buck first. But something more than bloodlust runs through his veins tonight. He’s hungry for Hartley, yes, but Tau desires him for more than just a quick meal. He wants to claim the buck as his own. Can the shadowed alleys of downtown Richmond hide this forbidden animal attraction? They've reached the end of Ellwood's residential stretch. The buck turns, trying to throw off his predators, and hurries down Nansemond in the direction of Cary Street. Tau and Leanna follow, curving their paths to cut across the street with barely any sound. The wind is loud in Tau's ears, as is the beat of his heart, but he can't hear his own breath and his paws are noiseless over the concrete. Beside him, Leanna moves as quietly as a shadow in the night. The buck glances back, sees them on his tail, and somehow finds a burst of speed that sends him skittering down the street with renewed energy. As he nears Carytown, overhead lights push back the night and Tau catches his first real glimpse of the buck. His shoes clatter like hooves among loose stones and gravel, and his short antlers look like polished bones in the sudden white light. Seeing him emerge from the darkness makes Tau's bloodlust surge and he leaps ahead, alongside Leanna now, right at the buck's heels. In the glance their prey throws over one shoulder, Tau sees exhaustion and fear etched into that young, handsome face. Soon you'll be mine, he promises silently, a hungry grin pulling at his lips. His whole body aches with anticipation. Before he reaches Cary Street, the buck changes direction and races for a cluster of brick buildings nestled on the corner. A burger joint, a tea shop, a hair salon, an optician's office. The buildings bump up behind the back of a Scientology center on one side, a bank on the other. The whole little island shares a parking lot with a pharmacy and a grocery store. At this time of the evening, all of the buildings and the parking lot are empty. Where the buck thinks he might be going, Tau can't imagine. He lets out a little laugh that sounds sinister in the otherwise silent night. He can't help it. They have the buck cornered. Leanna hurries ahead as the buck slips into a narrow alley separating two of the buildings. Tau is two steps behind her. In the close confines, he smells fear, sweat, and musky cologne. The mingled scent grabs his balls in a fierce grip and refuses to let go. In a low growl, he says, "Leanna, go." She ignores him, instead advancing on alley's dead end against which the buck trembles. Drawing back her lips as if in a hiss, she breathes in his scent and bares her fangs, the whiskers on her cheeks aquiver in delight. "I was here first." Anger surges in Tau. He lurches forward, pushing her aside as he roars in displeasure. The sound threatens to tear the night in two, it's so loud in the tight alley. 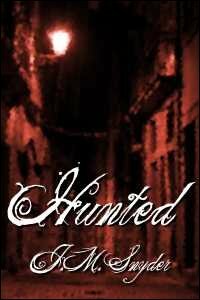 With one large hand on the buck's chest to hold his prey still, Tau whirls on his cousin and shoves her away, toward the alley's mouth and the night beyond. "Mine!" he thunders. "Leave him to me."